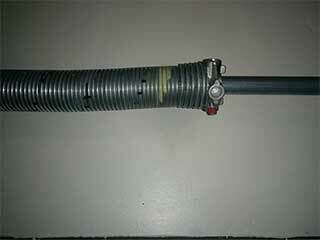 Garage door springs have two main responsibilities. They need to be able to support the weight of the panels, as well as use tension based force to raise them off the ground when the door needs to open. This makes them one of the most important parts of the entire system, but also one of the most hardworking ones as well. If the springs break, the door will more than likely slam shut and will be rendered completely inoperable. Torsion and extension are the two main types of springs that are commonly used today. Each uses a different method of operation to achieve a similar goal - to support the weight of the door and assist in its movement. There are a few variations of each type. Galvanized torsion springs, for example, are applied with a special coat of zinc that protects them from moisture and allows them to resist rust and corrosion. Oil tempered extension springs are treated to a special heating and cooling process which renders them more flexible and durable than their regular versions. The regular wear and tear these components have to suffer through on a regular basis makes them be one of the most common parts of your garage door that can be affected by a problem. A broken spring is not to be taken lightly, as when the incredible amount of tension they carry suddenly gets released, the coils can go whipping around your garage, and will seriously injure anyone standing in their path. Our technicians can carefully replace them after that happens, but we can also offer you a service that will increase their lifespan and greatly reduce the risk of such an accident. Most residential springs are made to last for an average of about five thousand to ten thousand cycles, depending on their type and how often they are used. Each cycle consists of one full opening and closing of the door. Our technicians can increase that lifespan. We will examine every inch of your springs for evidence of wear and tear, and if we find any of them to be lacking in some way, it will get replaced on the spot. What's more, we'll lubricate their coils to keep their operation smooth and efficient and make sure their tension is well adjusted to prevent them from overstraining needlessly. Our experts at Garage Door Repair Sherman Oaks can provide you with a wide variety of spring related services. Remember not to ever try to handle these components by yourself, as the dangers involved simply aren't worth the risk. Give us a call and we'll take care of it!